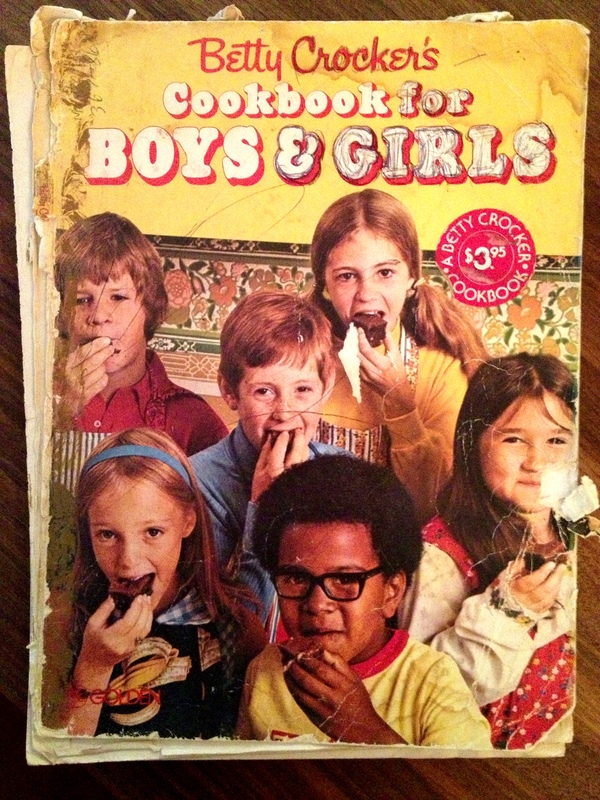 When my baby brother was born in 1981, a family friend gifted me with Betty Crocker’s Cookbook for Kids. My mom recently shipped my tattered copy to me along with some cookbooks I needed for a research paper. I used to read it obsessively–particularly the recipes for eggs in bologna cups and a ghost cake with flaming eyes. But the only thing I can recall actually making is hard-boiled eggs. (My family’s diet skewed more toward lentil burgers and fruit juice-sweetened carrot cake.) To this day, I loosely follow the hard-boiled egg technique set forth in this book. While waiting for your morning coffee to brew, place your eggs into a pot, cover with water by at least one inch, and set over a burner turned to high. Allow eggs to boil for one minute – or until you begin to wonder what that rattling sound is. Remove the pot from the heat, add a lid, and let stand until you have finished your coffee (about 10 minutes). Quick, portable snacks that are rich in protein can be hard to come by. Sometimes, when I tire of raw almonds and spoonfuls of peanut butter, I make a big batch of hard-boiled eggs and snack on them throughout the week. They’re also great to have on hand for a quick weeknight salad. Today I find myself unexpectedly working from home while recovering from an asthmatic condition brought on by tortellini fumes. (Don’t ask.) The weather is miserable, so I had resigned myself to making do with what food I had on hand. Egg salad is one of my comfort food fallbacks. Eggs will keep in the refrigerator pretty much forever and can be doctored up with whatever condiments and spices you have in your arsenal. Below was today’s working-from-home lunch. Consider it a jumping off point rather than a recipe. Combine 2/3 of a tablespoon of mayonaise, 2/3 of a tablespoon of very sharp mustard (though a basic Dijon will also suffice), a splash of sherry vinegar, 1/2 teaspoon of hot Spanish paprika, a tiny pinch of sugar, and salt and pepper to taste. Then stir in two diced hard-boiled eggs. 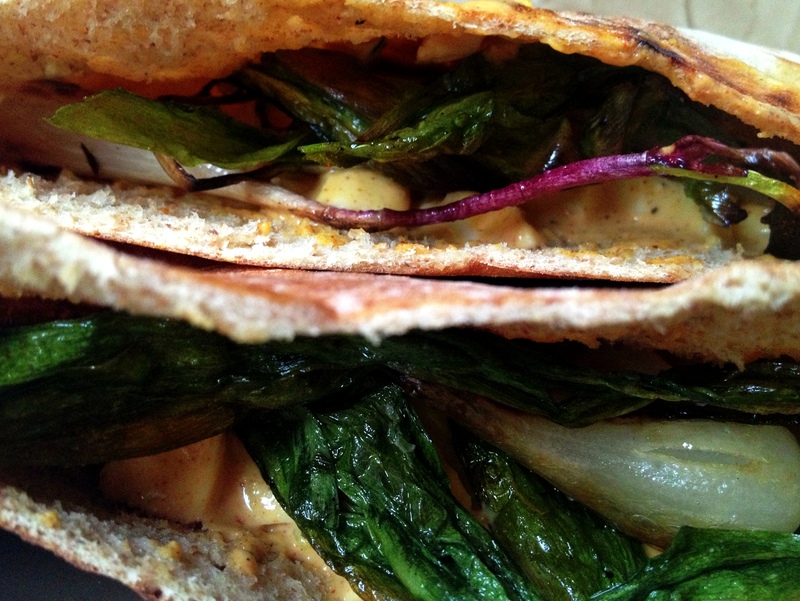 When the ramps are nicely colored, slice a whole wheat pita in half and toast it right in your skillet. Assemble and enjoy, taking care not to drip onto your keyboard. This entry was posted in quick lunch, vegetarian and tagged eggs, ramps by Jasmine Nielsen. Bookmark the permalink.